How did you feel while reading the Book of Revelation? Some would say they felt fear, dread, and terror. Others say they felt joy, anticipation, and longing. The Book of Revelation is not just about the Last Days. Best-selling author Pastor William Girao speaks about how we can recover the ultimate message of the last book of the Bible. 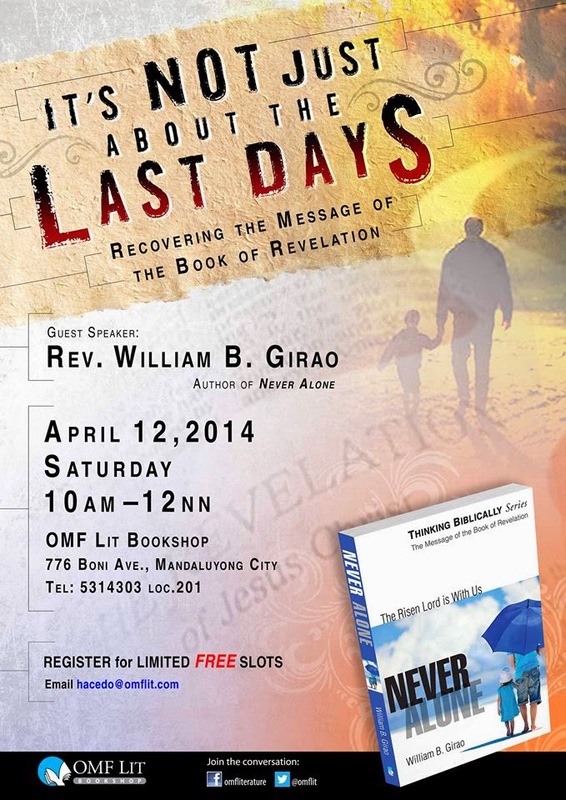 Join us on April 12, 2014, from 10AM - 12 PM at the OMF Lit Bookshop in Boni for his talk. We encourage pastors, small group leaders and youth leaders to attend this talk to give you a different perspective as you lead the people in studying the Word of God. To register, please email hacedo@omflit.com.